Anja Salonen's painting When the back door is the front door and the garden too, at Ltd Los Angeles in NADA New York 2016. 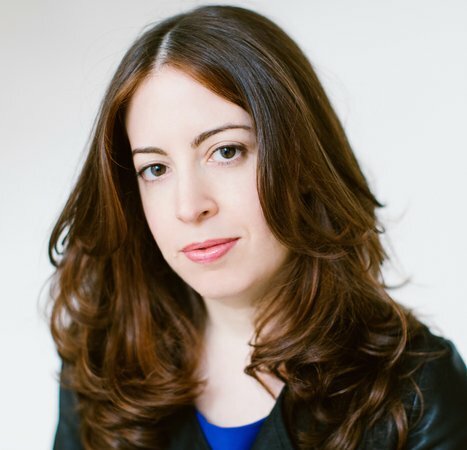 Artspace's deputy editor shares the works she's looking forward to seeing at NADA New York 2016 (at Basketball City in New York from May 5 to 8). Mysterious, ambiguous evocations of the American West and cowboy masculinity dominate this Yale MFA grad’s photographs, some of which were taken at the men’s college Deep Springs in the California desert. 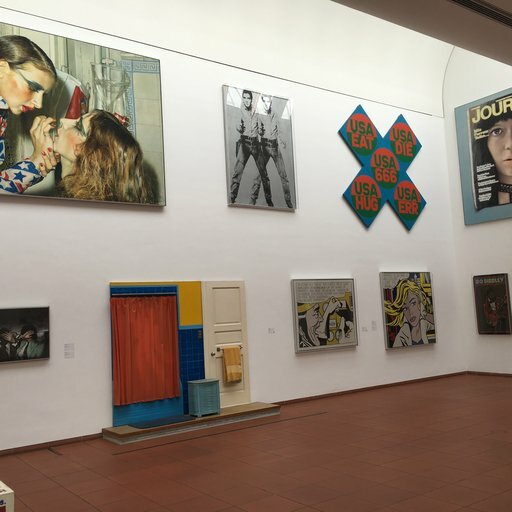 Faust’s more than three-decade photographic survey of museums of all kinds, Museum, 1981-2014, links big encyclopedic institutions to more specialized venues (the Museum of Belgian Railways in Brussels and the Bullring and Bull Fighting Museum in Seville, among others). 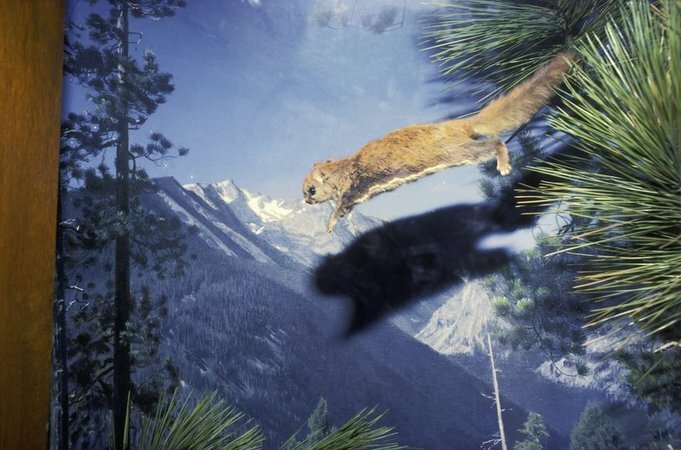 Sweeping and anthropological but given to moments of quirkiness, it has something of the spirit of Fischli/Weiss’s slide shows. 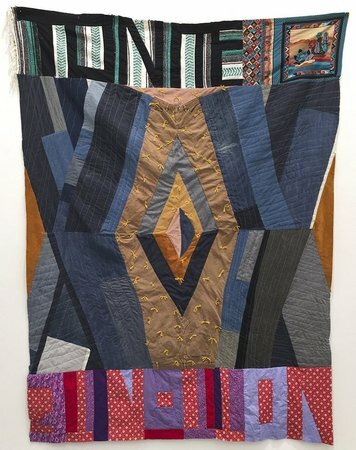 The Nevada-born, Los Angeles-based artist’s frequently profane text quilts (this one seems to be an exception) are part of a larger sculptural practice, which includes assemblages with a frontier resourcefulness and a no-nonsense attitude. 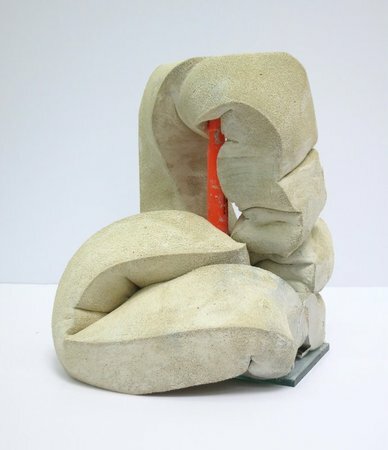 Hardy seems to have a natural affinity for polyurethane foam, in the way that Lynda Benglis does for poured latex. 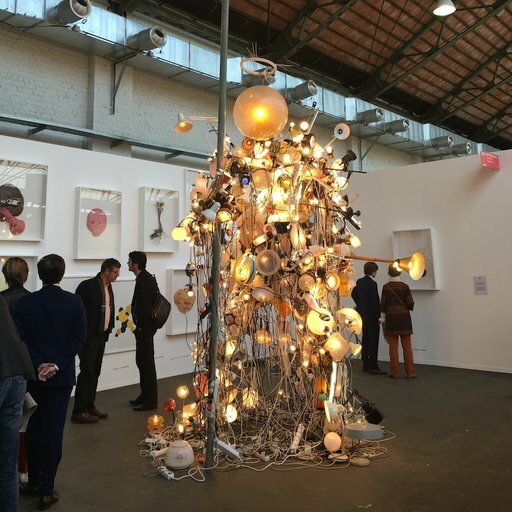 In his sculptures at NADA, his springy, squishy material of choice is held in check by more intractable substances such as aluminum and cement. With their grids of tiny, colorful objects, humans, and animals, in various combinations and permutations, Ikezoe’s paintings remind me of emoji—as used, perhaps, by someone with the visionary imagination of a Hieronymus Bosch or a Henry Darger. I first saw Lawson’s work in “Ruffneck Constructivists,” curated by Kara Walker for the ICA Philadelphia, where she was showing a haunting and incisive series of family portraits taken, over the years, on visiting day at a prison. 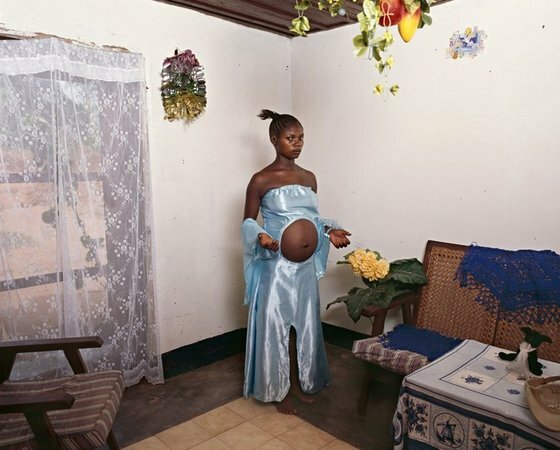 This picture of a visibly pregnant woman in the Democratic Republic of the Congo shows her recent shift to locations outside America and to more conventional studio portraiture, but her intimacy with her subjects is as unforced and provocative as ever. 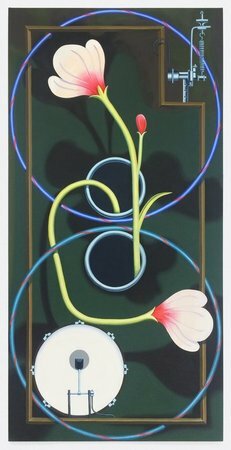 A standout from the Whitney’s recent exhibition “Flatlands,” the Los Angeles-based Martin makes rigorously composed, surface-fetishizing paintings that evoke Picabia’s machine paintings, the Chicago Imagists, and the Precisionism of Charles Sheeler. 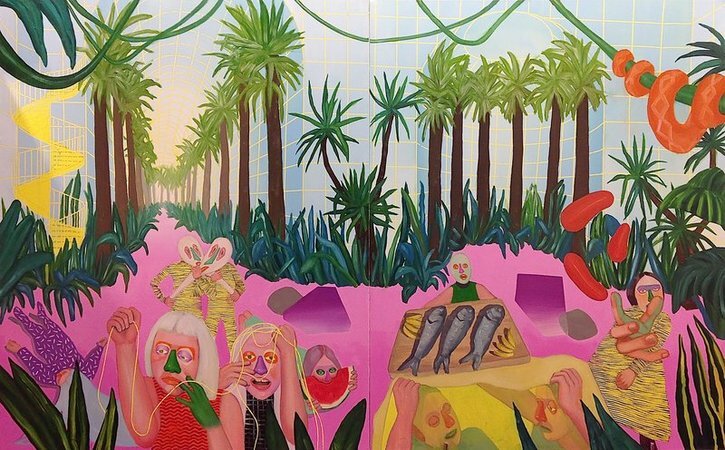 This Los-Angeles based painter of zany figurative tableaux is new to me, but I’m compelled by the consistent world articulated in her candy-colored, digitally-inflected canvases; the artist has described it as a “seamlessly realized un-reality,” which feels about right. 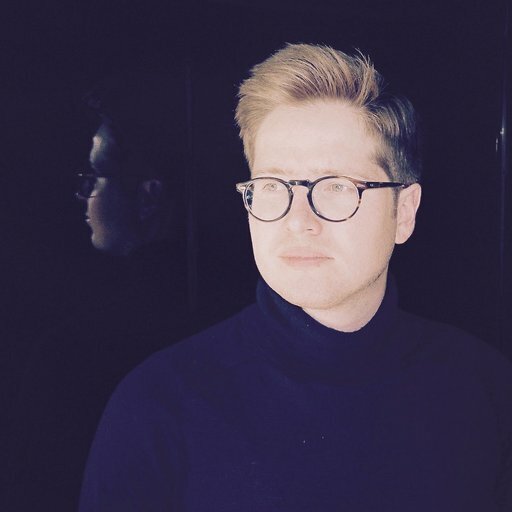 I met Sachsalber last winter at White Columns, where he was working quietly on one of his signature durational-yet-futile performances as part of Performa 15: assembling a 13,200-piece jigsaw puzzle of Michelangelo’s The Creation of Adam with his father. 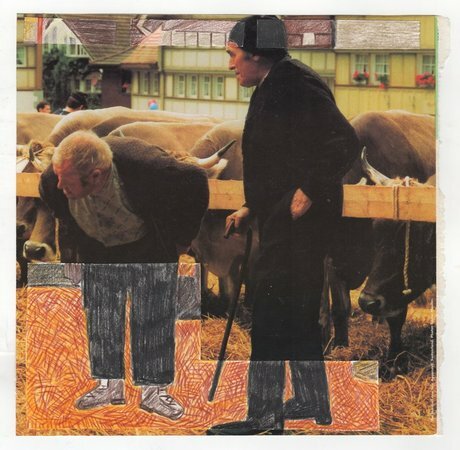 At NADA, he is showing collages made from the Swiss dealer Bruno Bischofberger’s longstanding back-cover ads in Artforum. Terna, a Vienna-born Holocaust survivor who is now in his ‘90s, first started to make art on a scrap of paper in a concentration camp. 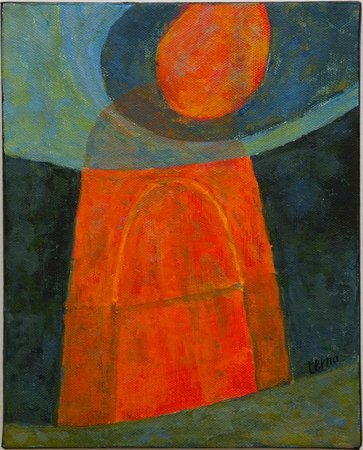 In the decades since his liberation he has channeled his memories into semi-abstract paintings in which glowing doors and portals figure prominently.